Even before they got the vote, young people were historically involved in politics, particularly in the last half of the 19th century. 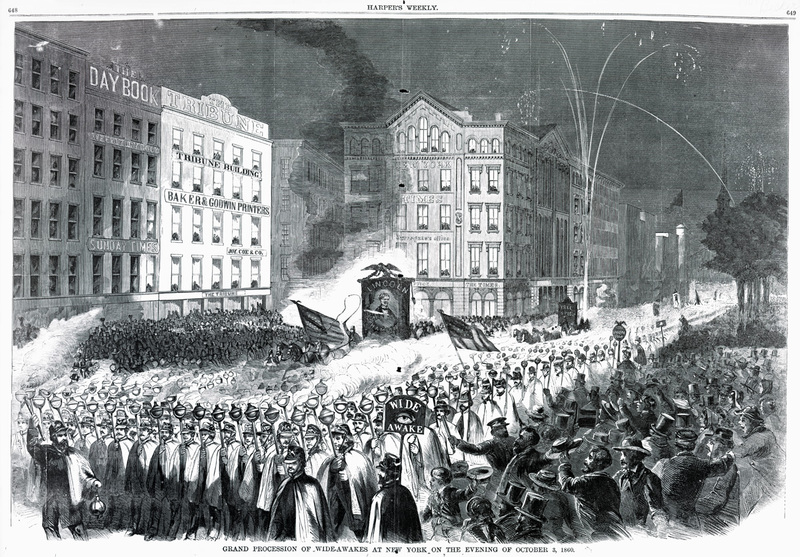 From 1840 to around 1900, young men marched in uniform, carrying illuminated torches and lanterns in parades that must have been a spectacle to behold. Designed to last only through an election season, these lanterns are often in fragile condition today—and that's where conservation comes in to light the way. In the museum's new exhibition, American Democracy: A Great Leap of Faith, visitors will come across a case full of campaign torches and lanterns, some of which are made of paper. The paper lanterns presented unique conservation challenges, as they were not meant to last long and have deteriorated in different ways. These lanterns are a great example of conservation work in action. Down in the conservation lab, we treat fragile items that are often unable to be exhibited or used for research due to their condition—bringing them back to life, in a sense. The eagle paper lantern currently on display was an especially interesting item to work with. The bottom of the lantern is made from a thicker, heavier card stock than the rest of the lantern, and inside at the bottom there is a small metal candleholder. The lantern was meant to be lit by candle inside and held from the top by a thin metal handle. At this point, however, the paper has weakened and torn, making this original handling impossible, partly because the base is too heavy. The paper of the lantern is accordion-folded, and the majority of the folds were damaged in some way—either already torn or looking like they might soon. The worst of the damage was found toward the base, where the paper had torn completely because of the strain from being held as intended. These folds all had to be either repaired or supported with a thin Japanese tissue adhered with wheat starch paste. In this case, I used kizukishi, a slightly thicker, strong, long-fibered tissue. I worked from the inside of the lantern to repair tears, so this tissue wouldn't be seen. I was able to use the opening at the top to access the repairs, though it was at times challenging to keep the lantern open to the right height and tension as I worked and waited for repairs to fully dry. To keep the lantern open after treatment, I cut a piece of Mylar (an inert plastic that can be sealed to itself at the edges) equal to the circumference of the lantern, and to the most comfortable height for the paper. We like to trust paper and the objects we work with to tell us how to work with them, rather than force them to do what we'd prefer. When advising on book openings for display, for example, we figure out where the book opens most comfortably, without too much strain on the binding. The same idea works here, so I extended the lantern as far as the paper felt safe. I cut Mylar to that height and placed it inside. It worked to keep the lantern extended. For display, we knew it would be potentially damaging for the lantern to hang from its metal handle, but everyone still wanted it to look like it was hanging. Our mountmakers devised a solution that gave the lantern a clear plexiglass circle to sit on, with an arm that goes up a side and attaches just inside the upper lip to hold the lantern in place. It is attached to a ceiling-mounted rod, giving it the effect of hanging. A box has been made to the dimensions of the lantern for long-term storage when it isn't on display, so this item that wasn't meant to last will now be safe and stable for many years to come. Carrie Smith worked as paper conservator for the exhibitions in the museum’s new wing, The Nation We Build Together. She thanks museum photographer Hugh Talman for the photos and recommends learning about this project at The Henry Ford for further reading. Still want to know more? The author enjoyed this newsletter update from the Conservation Center for Art and Historic Artifacts.